As a photographer, Victor Hasselblad had a strong interest in the natural history of birds. He had been a devoted birdwatcher since his teens and used a variety of cameras in the twenties and thirties to capture images of birds. One of the goals in manufacturing his own camera was to have a camera that he felt would be ideal for bird photography. He felt that the small 35 mm negative would not provide sufficient detail. The existence of Hasselblad cameras has been attributed to his personal desire to have a better camera with which to take photographs of birds. Only a few examples of his photography are generally available. He published some articles in natural history journals and small circulation periodicals in the 1920’s and 1930’s. 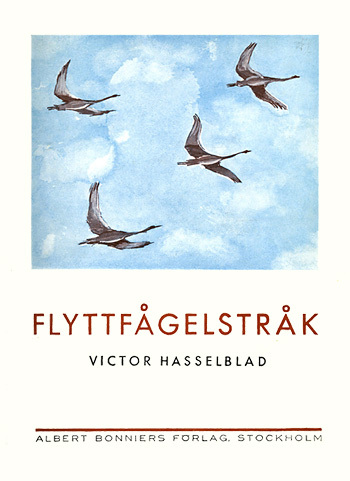 In 1935 he published a book “Flyttfågelstråk” (“The flight of migratory birds”) (Albert Bonniers Publishers) illustrated by his own photos, but noting he was not happy with the photographic quality. He notes in the foreword that more than 90% of the photos in the book were taken using a Leica – the best equipment that was available to him for bird photography at the time. The cover was an artist interpretation of one of his photos! His interest in bird photography continued after he developed his own camera, but the pressures of running his camera businesses meant that he had less time for bird photography. He did continue to photograph, but few of his photos were seen by the public. 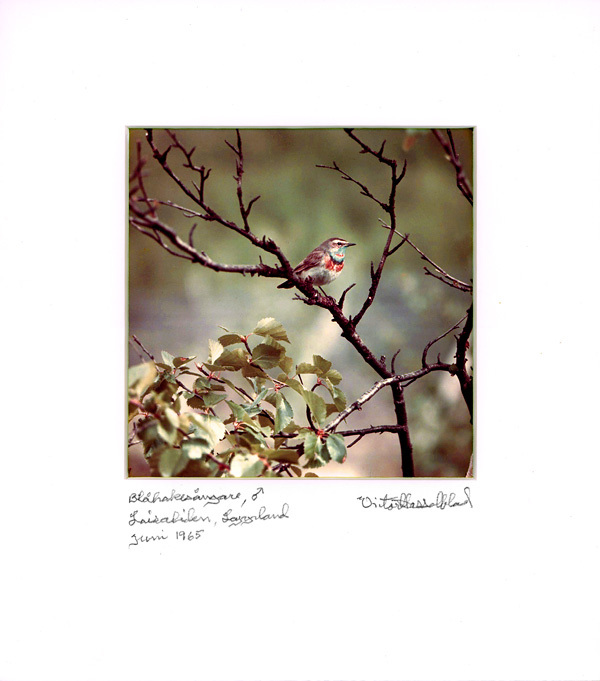 He made several photo expeditions with his friend Crawford Greenewalt (president of Dupont) who was the world expert on hummingbirds and who spent much of his time photographing this fascinating family of birds. Sven Gillsäter was a friend and renowned wildlife photographer who accompanied Victor on many of his photography trips. Victor Hasselblad’s last photographic vacation was a memorable trip with Gillsäter to the Galapagos in 1978. Victor’s collection of bird photos were donated to the VIREO library (Visual Resources for Ornithology) at the Academy of Natural Science in Philadelphia which holds the largest collection of bird photos in the world. In 1975 he was asked to put on an exhibition of his bird photos in Oslo. 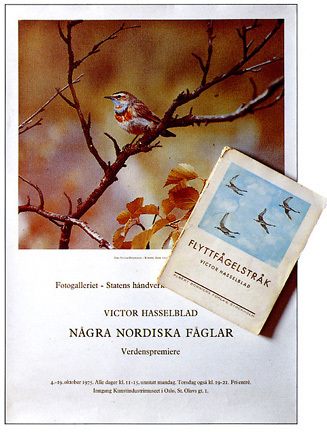 The exhibition was called “Några Nordiska Fåglar” (“Some nordic birds”) and ran from 4-19 October 1975. The poster from that exhibition with a copy of “Flyttfågelstråk” over top of it are shown to the right (from Forum magazine 1991-1 and an article by Evald Karsten). There were 64 12 by 12 cm prints displayed at this exhibition Oslo. In response to the positive feedback about the exhibition in Oslo, in 1977 twenty five sets of twelve of the photos were made up and sold as fund raiser for the World Wildlife Fund or given to friends or clients (a total of 300 prints). The prints are mounted on matt board and covered with a beveled matt. The overall size is 21 by 23.5 cm with a stamped identification on the back. They were titled “the First Series” but there was no subsequent series. 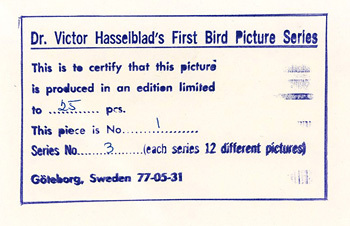 One of the attractions of these prints is that they all have a handwritten identification of the bird in the photos with date and location and signed by Victor Hasselblad. He obviously spent many hours doing the descriptions and signatures for these mounted prints. 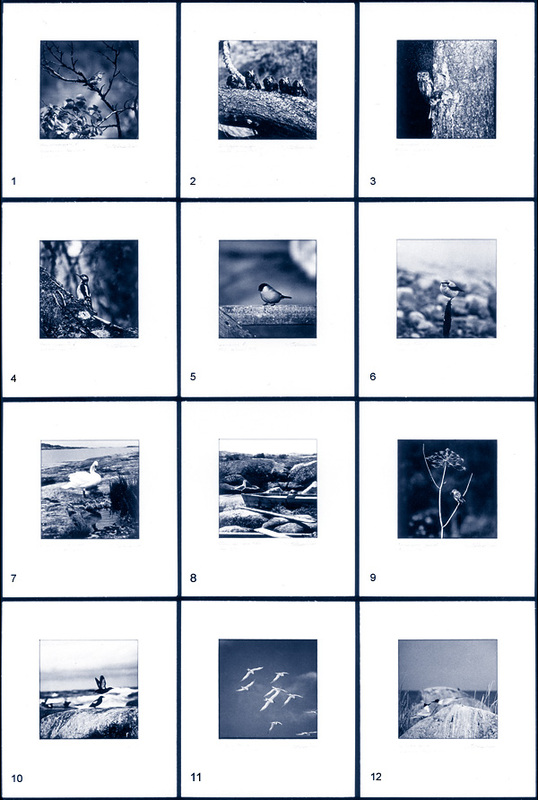 Some of the photos in the exhibition and in the sets of 12 were taken by Victor Hasselblad in May and June 1975 in the Nidigen Islands while using one of the preproduction 2000FC cameras – his personal testing this new model camera. The photos are very nice pieces of photographic art. Photographing birds is an admirable skill and with the advent of film and then digital auto focus SLR’s, few photographers now use Hasselblad cameras and it seems ironic that one of the original purposes envisioned for the camera has now been largely superceded. Male Bluethroat - Luscinia svecica svecica L.
Below is a list of the photos from the 25 signed 12 print sets that were made. A thumbnail index is also included. Many of the photos have been published elsewhere (see the references below).